Sencha tea is a famous and popular tea due to the perfect balance of sweet and bitter flavours. This is one of the most common types of tea you will see when you drink green tea. The other common type of tea which is popular with Japanese people to drink everyday is called Matcha. Matcha is a variety of tea where the lea leaves have been crushed into a fine powder which is simply mixed with hot water to make the tea. It is also used extensively in the traditional Japanese tea ceremony called Chado or Chanoyu. It is often made with the same type of tea leaves that are used to make Gyokuro. Sencha and Matcha are the two types of teas that we would recommend the most for people looking for a healthy and delicious green tea. Hojicha tea is made using roasted tea leaves, giving it a mild taste with much less bitterness and a fantastic fragrance. This reddish-brown tea is very easy to drink. Gyokuro tea is an expensive type of tea which is grown in the shade of the sun to give it a naturally sweet aftertaste and soft aroma. 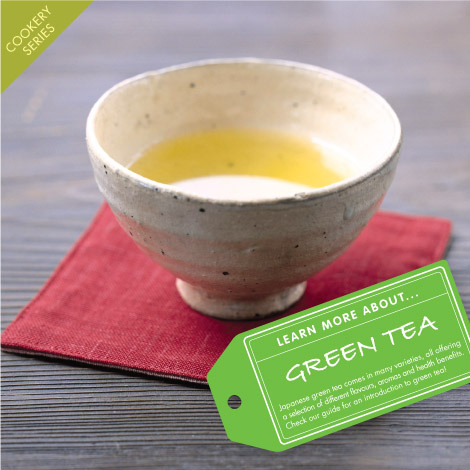 Drink Gyokuro tea slowly to savour the distinctive tastes. Genmaicha tea is green tea mixed with roasted brown rice. This fragrant, easy to drink tea is rich in vitamins and a great way to relax due to the lower caffeine content. Posted in Food, Tea and tagged Green Tea, matcha, sencha. Bookmark the permalink. I was just thinking about trying out Matcha for the first time just before I read this post! I am a big fan of the Suntory Iemon Green Tea range and am very disappointed to find that it is no longer available at the Japan Centre. Iemon’s tea bags and bottled drinks, especially their sencha with matcha powder tea bags, are awesome!! If the Japan Centre is planning to introduce their own range/brand of green tea, I hope they would consider introducing a variation of sencha that comes with matcha powder as a replacement for Iemon’s. Thank you for the excellent post.. Best Regards.